Lingonberries grow in dry, sparse pine forests, pine forest heaths and bogs. Soon the berries are fully ripe in the forest, for picking anyway. 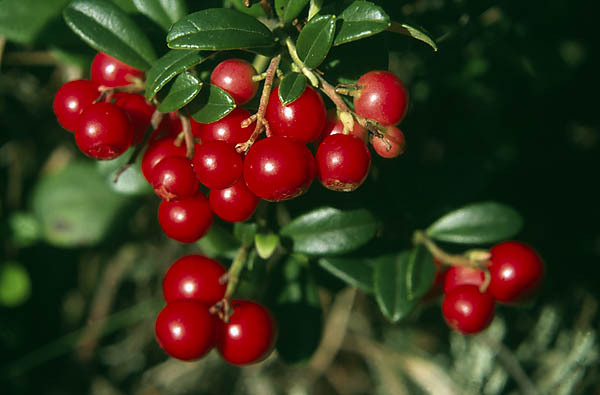 The evergreen lingonberry plant has glossy leaves dotted with yellowish glands on the underside and just now picture-pretty red ripening berries. The plants are connected to each other in the soil. A single plant grows for 4-5 years, then side shoots develop from buds on the stem and begin to grow away from the mother plant. After having grown some twenty centimetres in the soil a few branches from the rhizome appear in the light above ground, and in 3-4 years develop into a new shrub which already bears fruit then. The fruit-bearing stem dries, but from buds at the bottom of the stem new erect stems grow out and all is repeated. A great number of dwarf shrubs develop from the mother plant. In 15 years the mother plant dies and yields its place to „younger“. A similar life cycle is typical of all so called partial shrubs. Birds like eating lingonberry berries in the autumn and so spread seeds, but seeds are not important to the propagation of the lingonberry. The berries are delicious, beneficial and keep well thanks to the content of benzoic acid. So – to the lingonberry woods..